Hey, lovelies! I hope that the new year will be the best year of your life. May all your dreams come true and all your hopes are fulfilled! I’ve got something great information for you. Have you heard about the Green Tea plantation in Jeollanam-do? 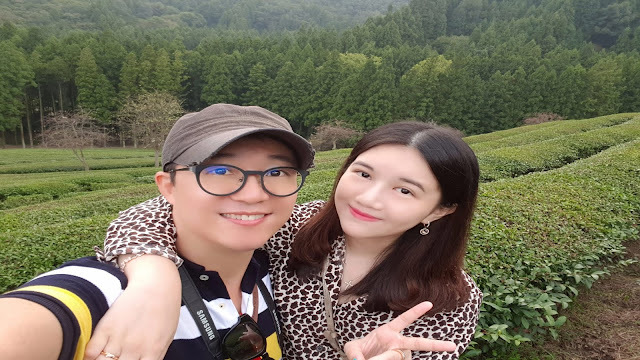 It has always been on my list of must-see places in Korea and finally, my husband and I advantage of the unusually beautiful weather and decided to make a day trip to Boseong Green Tea Plantation (보성녹차밭). 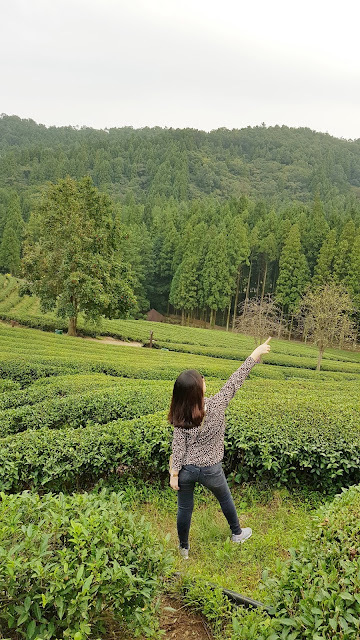 I know not everyone likes green tea but I’m pretty sure whether you like or not, you’re gonna fall in love for this place! My husband and I love a little weekend getaway. We believe that traveling is one of the best anti-stress therapies. We have fun anytime we are together, especially when we are able to travel and explore new places with one another. Travelling makes us happy, especially the beautiful place excites us every time. 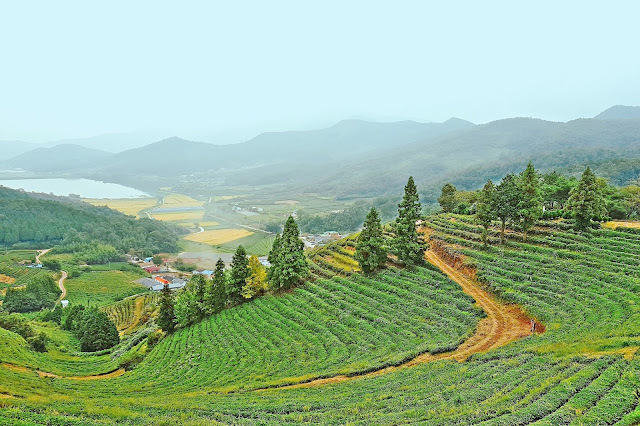 Boseong Green Tea Plantation is located in the South Jeolla Province in Korea, and it is very famous for their acres of green-tea fields, which is visited by tourists and locals alike. It's no wonder why many people who want to come here as it’s one of the most scenic places to photograph and easy in getting inspired. Don’t believe me? Check out the pictures below, I don't use photoshop, that is what it looked like in the real! Boseong is very far from Seoul, a one-way trip will take you approximately 4 to 5 hours, so plan your trip in advance so you can enjoy your time at Boseong to the fullest. It is easy to find the place if your navigation is well prepared. After a long journey to get to the Boseong Green Tea Plantations, we finally arrived in the early morning of a beautiful autumn Sunday. When you arrive at the Boseong Green Tea Plantation you need to purchase tickets. 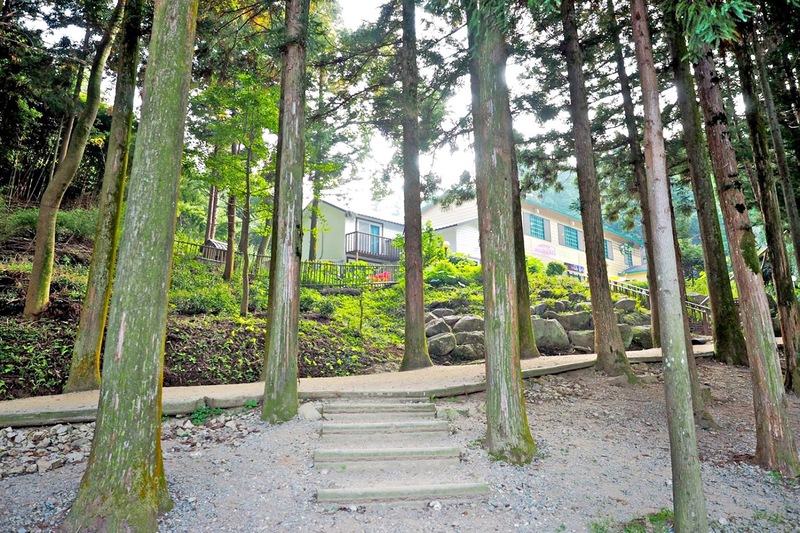 Entry to the Boseong Green Tea Plantation is 4,000 Won per person. After paying the admission charge, we began the short approach to the field. Map of the Boseong Green Tea Plantation. 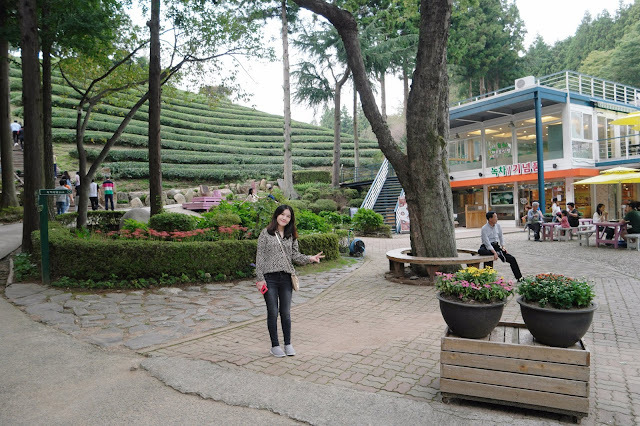 If you do visit Boseong Green Tea Plantation, ask for an English brochure from the ticket collector. Remember to ask as they will not give you if you don't ask them. Before you get to the tea plantation you need to walk along a wooden path lined by a running brook and towering Japanese cedar trees. We visited in the middle of October and found it to be stunning. The trees were still green and many of the plants still had flowered. 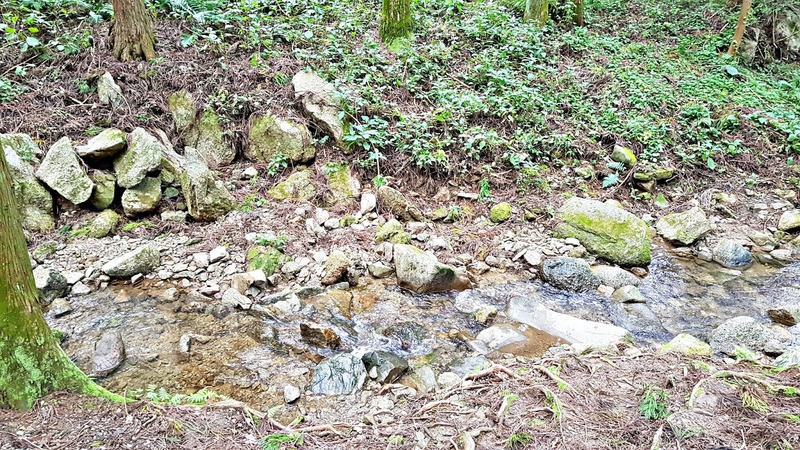 The small waterfall that you can see before you enter the Boseong Green Tea Plantation. 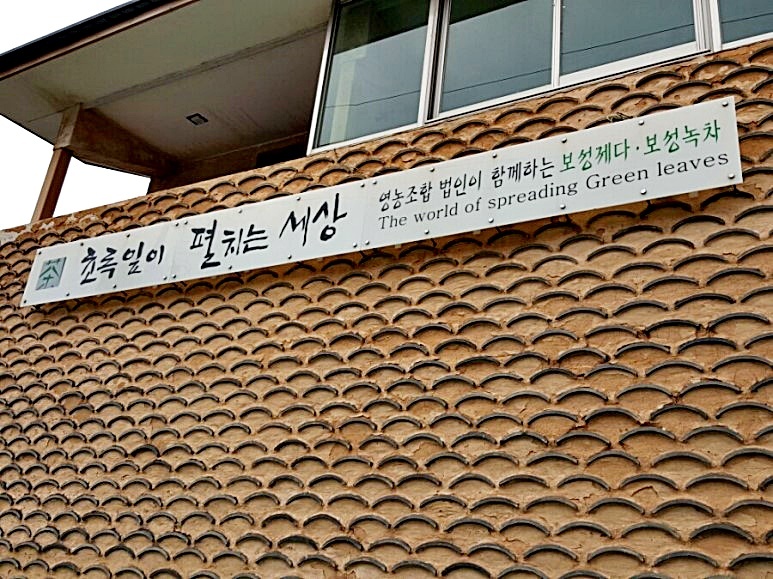 Boseong Green Tea is a special product produced in Bodsung district and well known for great quality. 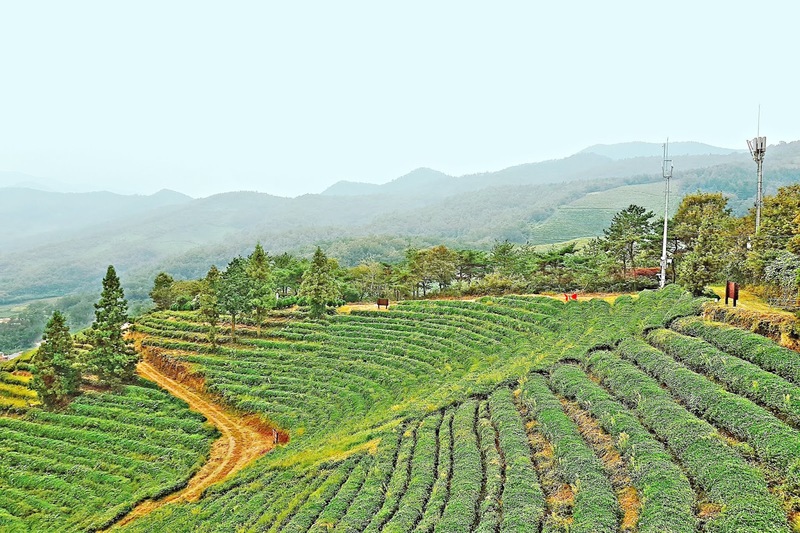 Boseong County is the largest tea producing area in Korea. 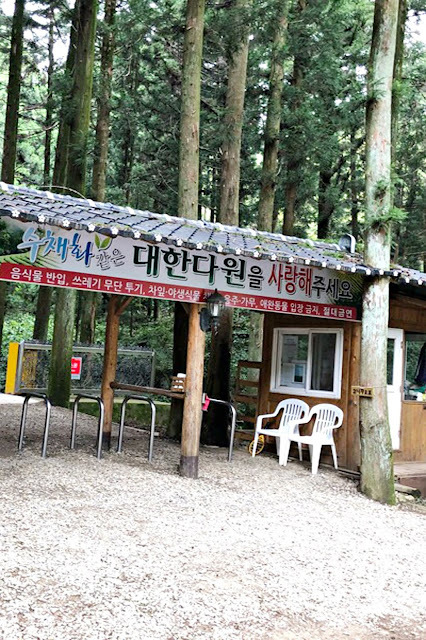 It is so called as to be called as DongguyeojI-Seungnam (meaning "tea house" in the Joseon Dynasty). 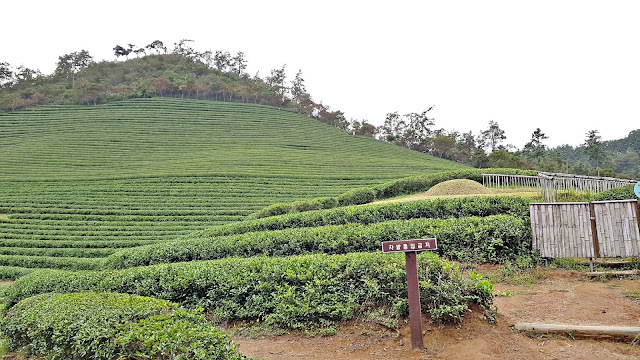 Tea produced in Boseong County is still active in growing tea plants, accounting for 40 percent of the nation's tea production. 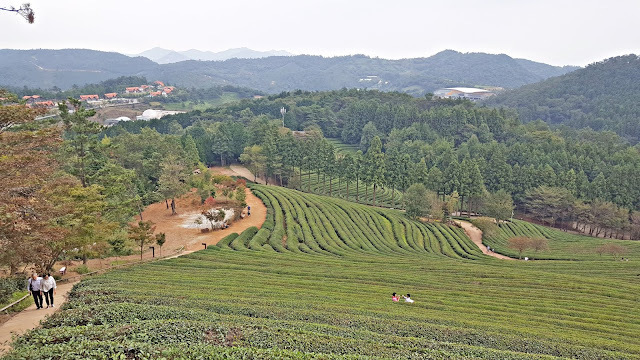 Boseong is known as the green tea capital of Korea. The surrounding climate and soil provide good conditions for growing a unique green tea that has a distinct taste and aroma. Almost one-third of all tea farmland is located in Boseong and nearly half of all green tea production in Korea comes from the area. 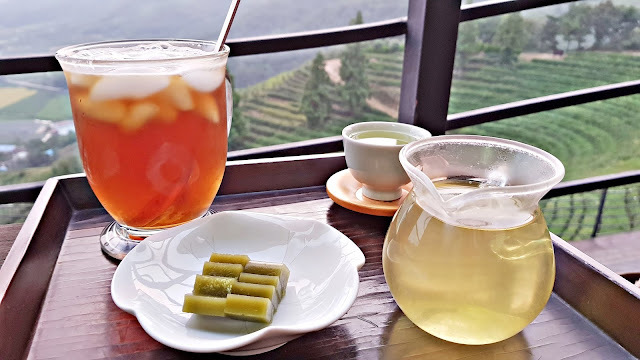 This status has been carefully crafted in recent decades, partly due to the long history green tea has with the area. 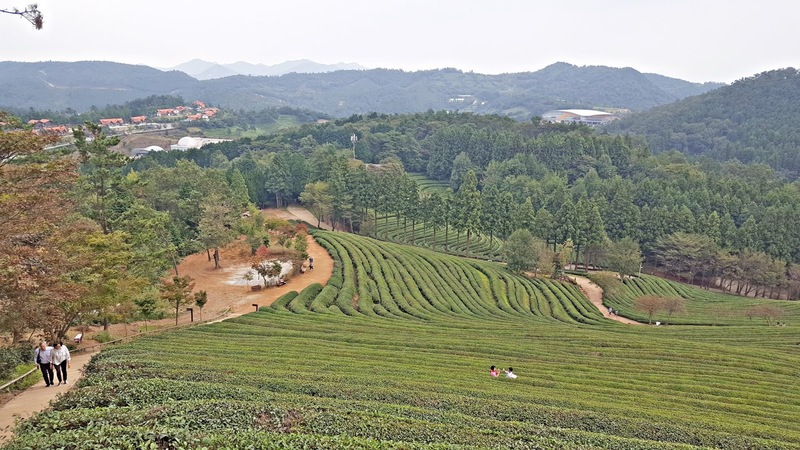 Green tea has been produced in Boseong for the past 1600 years. 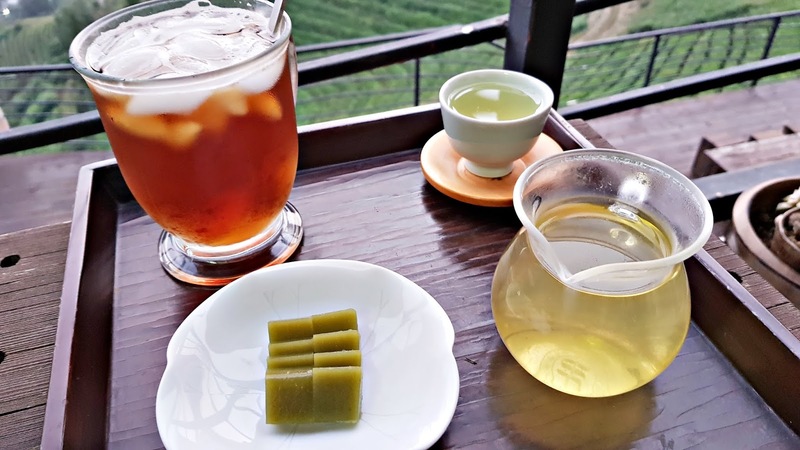 The earliest historical mention of green tea in Korea was from the reign of Queen Seondeok of Silla in the mid-7th century AD. 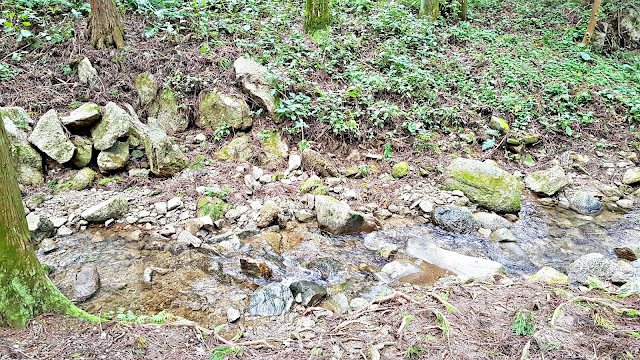 Nearly two hundred years later, historical records indicate green tea seeds were planted at the foot of nearby Jirisan Mountain. During the Joseon dynasty, green tea began to fall out of favor due to its close association with Buddhism but was still enjoyed by certain parts of the population and the Jirisan plantation continued to thrive. But it was not until the 1930s that green tea was produced on a large-scale basis. By the 1970s, huge, terraced farms as large as 250 acres became commonplace among local mountainsides. 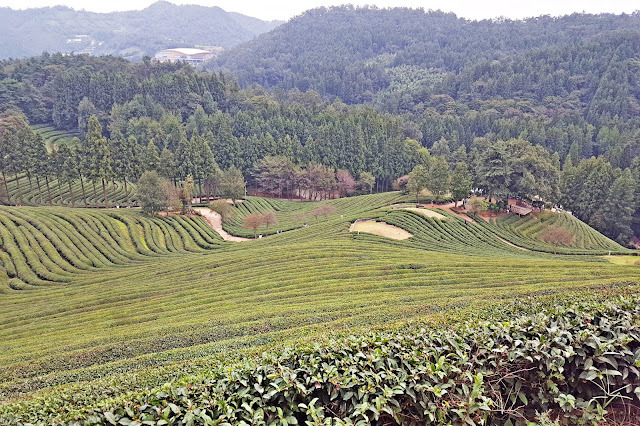 The 1980s marked the beginning of a decline in green tea demand which resulted in lower green tea output and degradation of crops. It was then that the local government decided to reinvigorate the green tea industry by subsidizing local green tea businesses and developing newer, more efficient means to increase output and quality by collaborating with local universities and research institutes. Local media outlets also made efforts to paint Boseong as the green tea capital of the country to increase dominance in the industry by local businesses and draw in tourists from around the country. Mt. 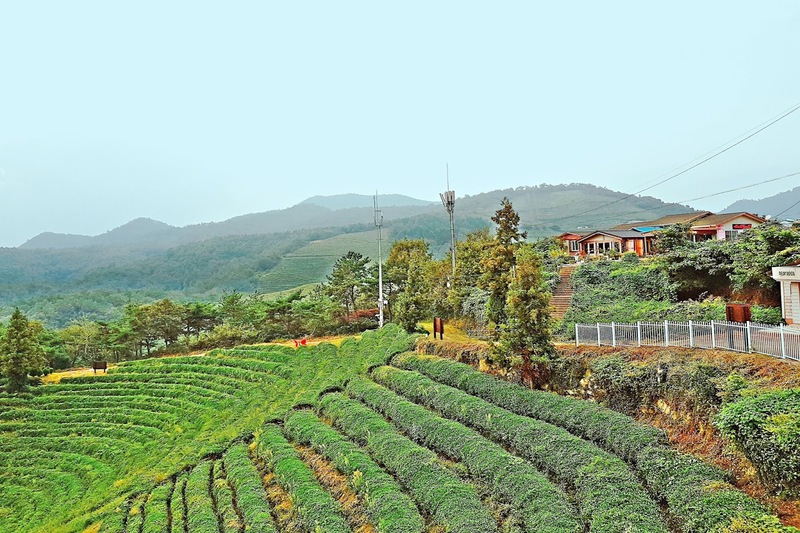 Hwangseong features the largest plantation in Boseong, the Daehan Green Tea Plantation. 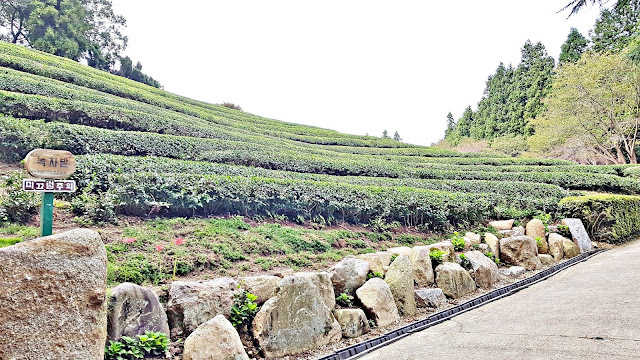 This plantation is responsible for over one-third of all tea production in the area. The mountainside features a terraced design that extends along the lower reaches of the mountain and is carefully manicured, providing an impressive view when seen from the top. This view is accessible by road and has become a famous stop for tourists. 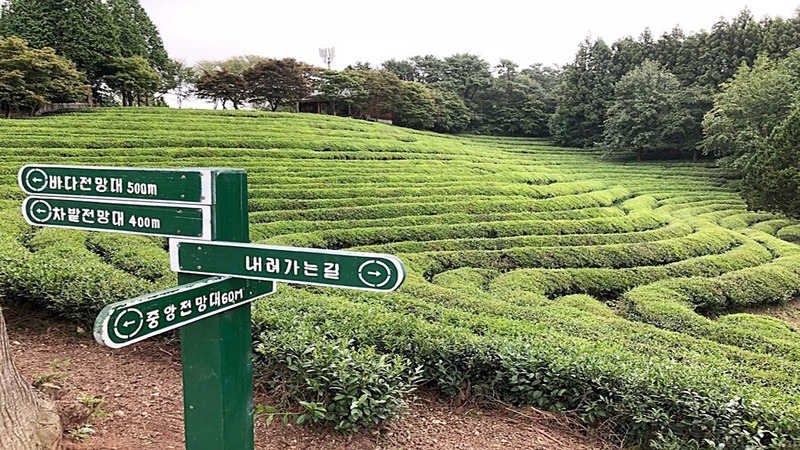 This tea plantation is also a filming location for a Korean Drama such as Summer Scent (여름향기), Ugly Alert (못난이 주의보), and The Legend of the Blue Sea (푸른 바다의 전설). I just expected a few small fields, but this was huge fields. Luckily on our visit, it wasn’t packed at all. 1. 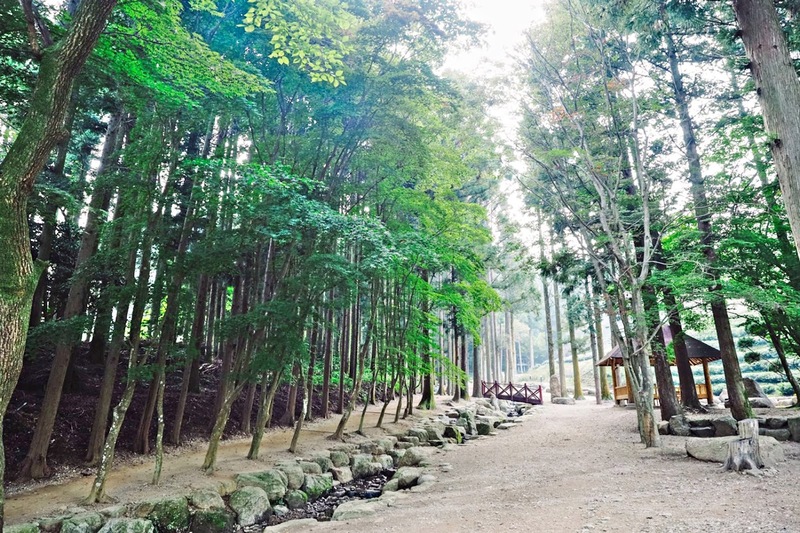 Boseong Green Tea Festival (보성다향대축제), period: 05.18.2018 ~ 05.22.2018. Go for a walk up the hill to get to the fields, admiring the rich greenery and enjoying the green tea scent as you go. 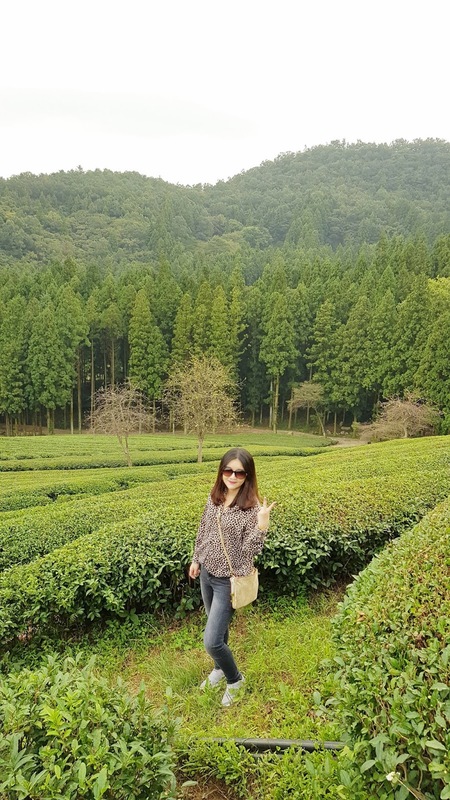 I loved the smell of green tea that was in the air and the air is really relaxing and revitalizing. 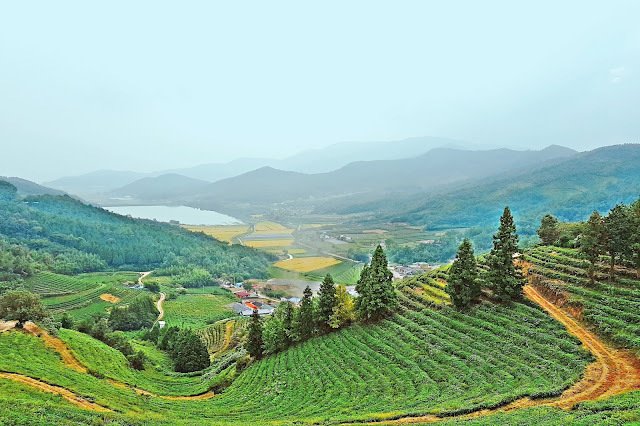 This green tea fields is absolutely stunning with its rows of green tea plants that covered the hilly area. 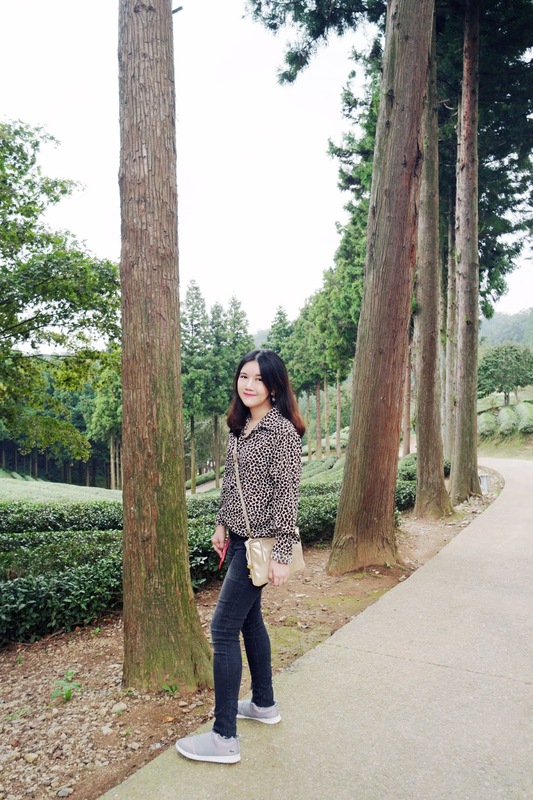 My outfit post of the day jeans and leopard print blouse. I always like to choose comfy outfits during my trip. My husband takes a selfie. One important note for you guys! There's a lot of climbing so make sure to wear proper shoes and make sure you dress comfortably. I love taking selfies with my husband. ☆(❁‿❁)☆ Anyway, it's tiring to write 'my husband' all the time so I will probably just write "Oppa" from now on. Okay?! Walking around may be a little bit tiring but you're rewarded with views of the fields, surrounding mountains, and the sea. There are benches along the plantation where you can sit down and relax for a while. The tea leaves were still bright green and looked really fresh. The view at the top is absolutely amazing. If you go on a rainy day remember to be careful because there are many stairs very slippery and the climb is really steep. 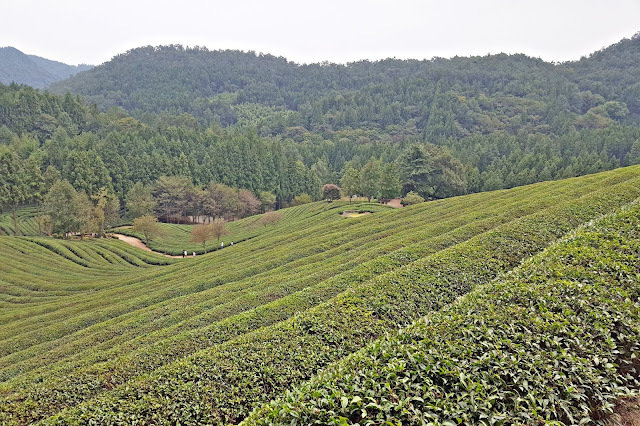 My husband and I spend time about 5 hours here to climbing up the green tea fields to the top. I highly recommend it specifically the top which offers a spectacular view of the sea if the weather conditions are good enough. We really enjoyed our trip to Boseong Green Tea Plantation. 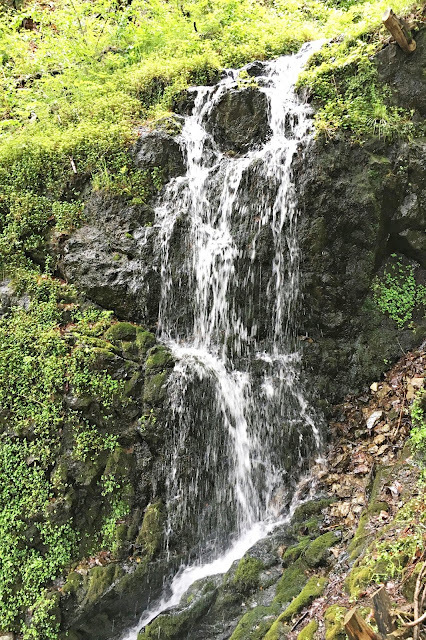 If you don't like going outside or hate hiking, this trip might not be for you. But for me, I really like to get out of the house, enjoy the nice weather, and see somewhere new place. The plantation is far more beautiful than I had anticipated. All of the pictures I’ve seen on Instagram are near the base of the tea fields so I presumed you couldn’t climb much farther but there are actually amazing views you can access from the top of the hills! 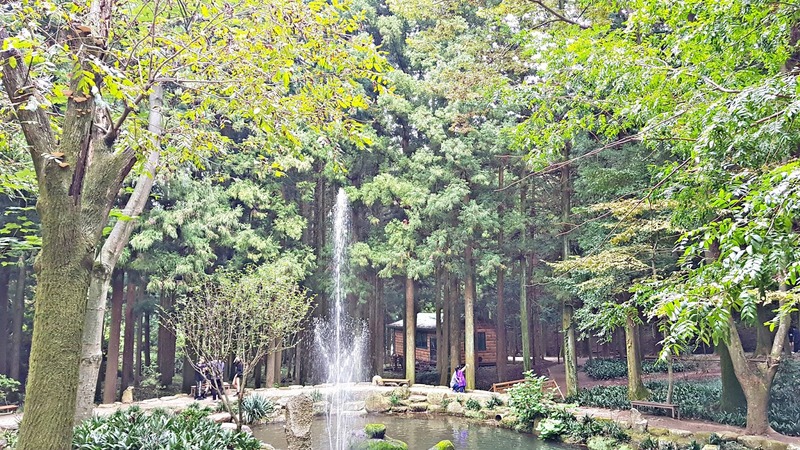 I didn't realize it but Boseong seems to have many other exciting things to offer such as waterfalls. Actually, I feel a little bit unlucky with the weather because it had rained since the morning but thankfully stopped at noon. Sunset can be seen from the top of Boseong Green Tea Plantation. On the way back we went through a small bamboo forest just located at the exit of the plantation and it was nice to see. One of the most stunning hikes I've ever done. It was a bit hard climbing to the top, but definitely worth it! 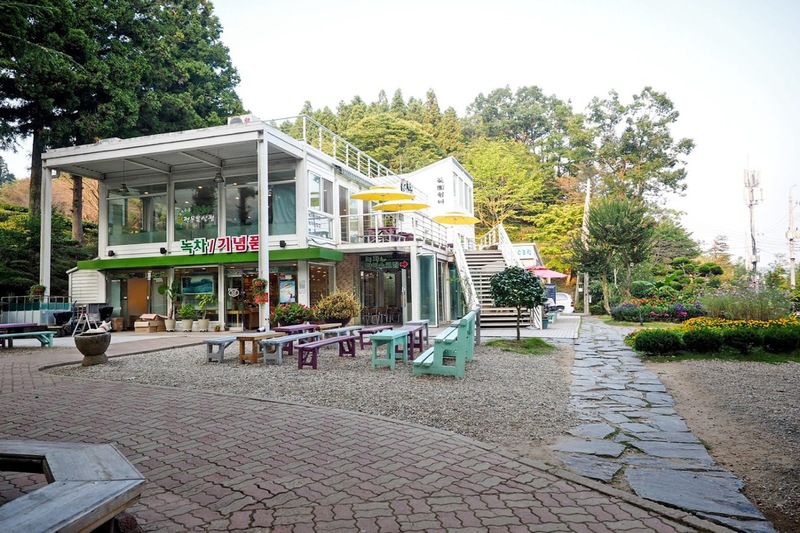 There are some restaurants, cafes, souvenir shop, and several green tea ice cream shop. Make sure to stop by the cafe or gift shop before you leave. 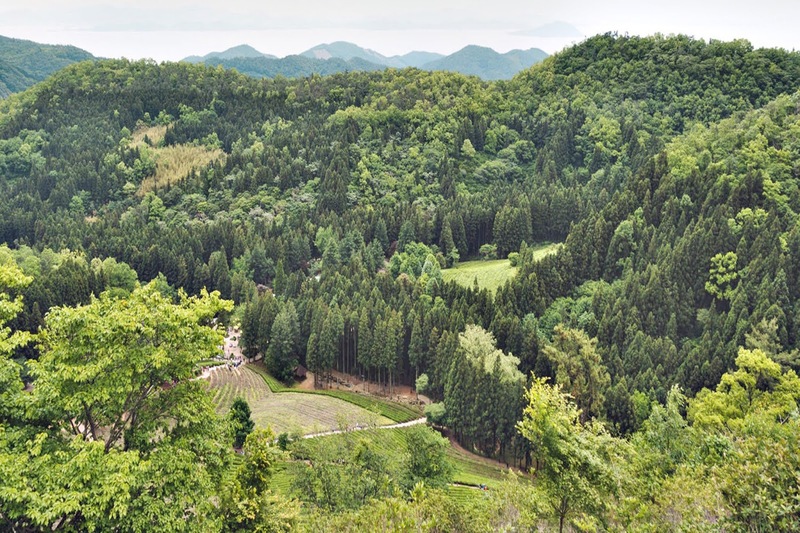 We enjoyed the beautiful view from our hike and then treated our self to some green tea ice cream. The green tea ice cream was the best I've had in my life, even though I typically do not like green tea ice cream, and even I can still remember the taste vividly. 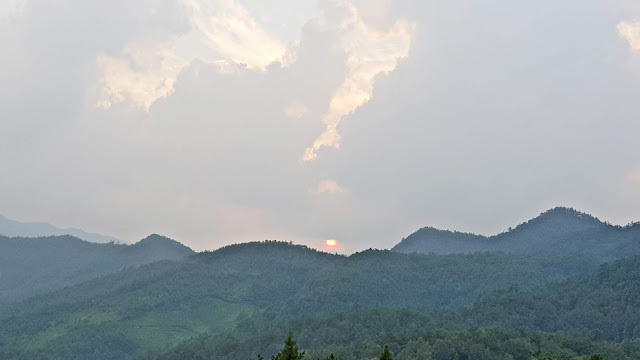 If you are from Seoul like me, it can be a long journey to come here. If you want to come here check out the information below! We came to Boseong Green Tea Plantation by private car, but it can also be reached by bus. From Seoul Express Bus Terminal, take an intercity bus directly to Boseong, or to Gwangju. 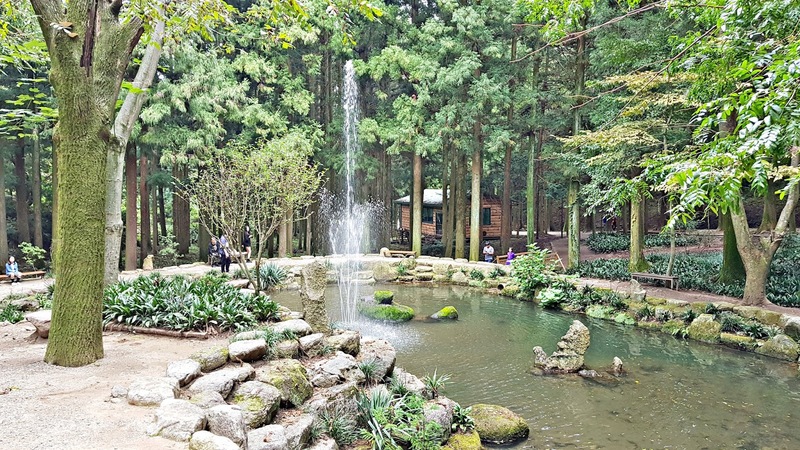 From Gwangju’s U-Square Bus Terminal, take an intercity bus to Boseong. 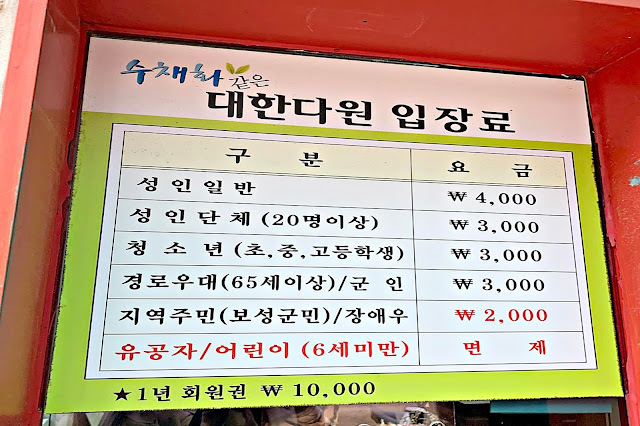 From Boseong Bus Terminal, either hail a cab or take the hourly Boseong-Gunhak bus to Daehan Dawon. After we finished eating ice cream and then we moved to a cafe specialty green tea. We went to this The world of spreading Green Leaves Cafe (초록잎이 펼치는 세상 카페). The cafe has a spectacular view! 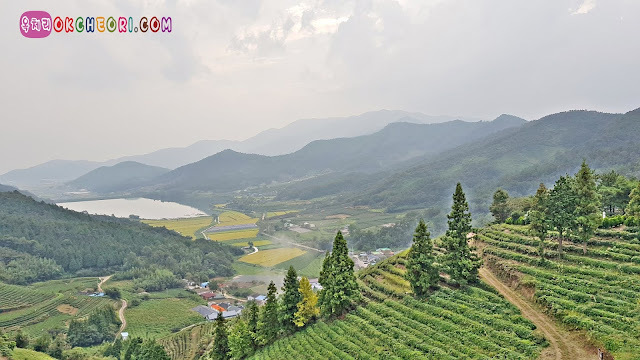 You can see the Boseong Green Tea Plantation from here. I ordered a green tea, and my husband ordered an iced coffee. The owner gave us free Yanggaeng (양갱). Yanggaeng is sweet red bean jelly. The Green Tea and Iced Coffee were of high quality. This red bean jelly (양갱) is sweet, soft, smooth, and silky, perfect for a dessert or mid-afternoon snack. 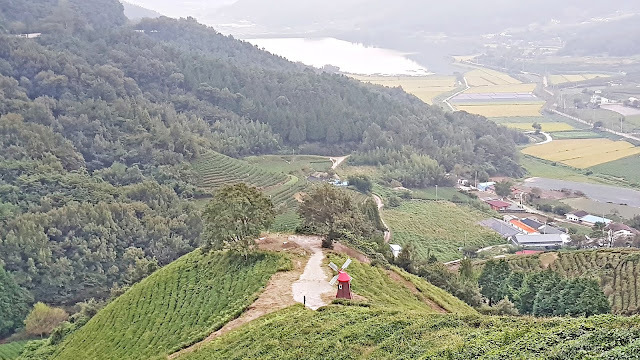 Overall, Boseong Green Tea Plantation is a beautiful place to visit where we can relax and see some nature green fields. If you are looking for a day trip outside of Seoul then visiting the Boseong Green Tea Plantation is a great place to spend a pleasant afternoon! 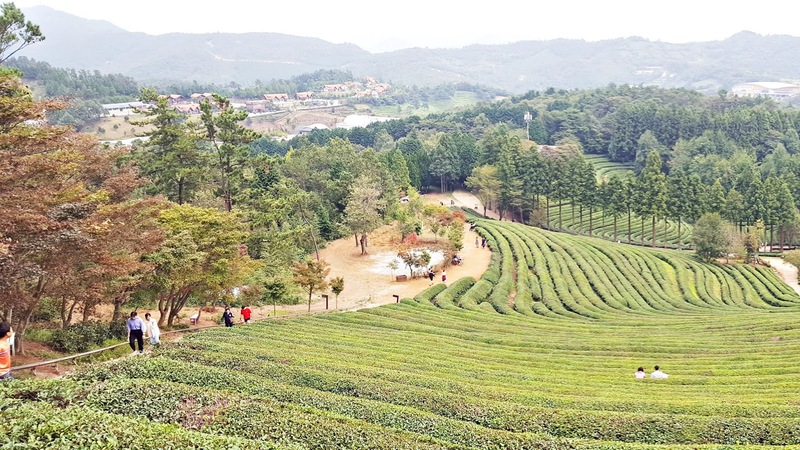 We really enjoyed our short visit to Boseong Green Tea Plantation and we hope to be back sometime soon! 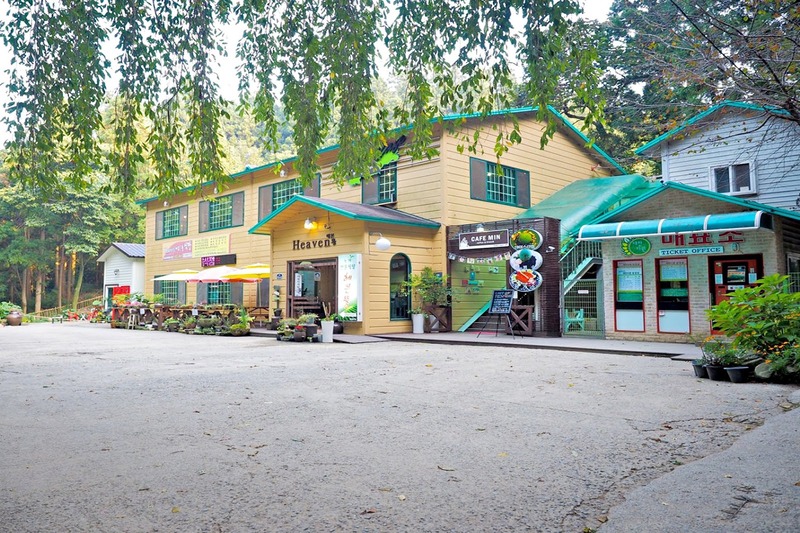 Have you been to Boseong Green Tea Plantation? 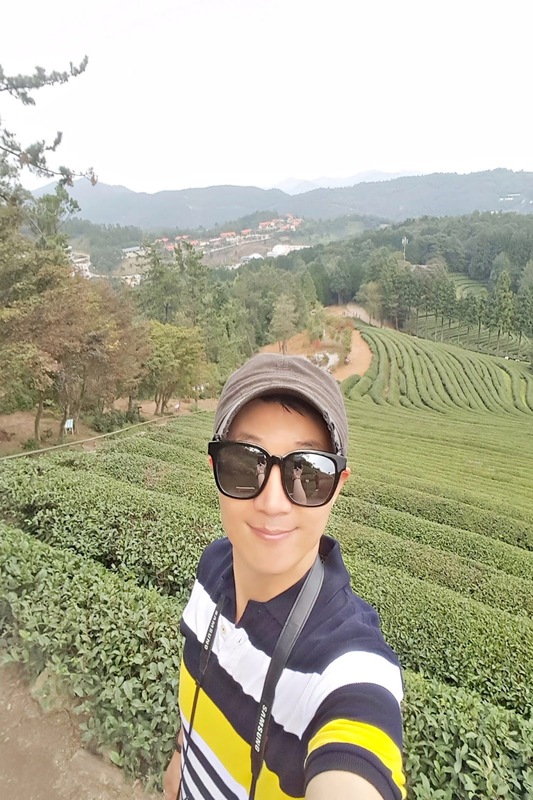 Don’t you want to go see the Boseong Green Tea Plantation yourself? Share your experience below! Well, that's it for today post! See you in the next post! 32 Responses to "Boseong Green Tea Plantation, Jeollanam-do, South Korea"
Wow that looks amazing. What a beautiful place and your drinks with the view is wonderful. I would be scared of the Bees too. What a wonderful place to visit!! The views are amazing!! I have new post on my blog, you can look that. I followed you, hope that you will follow me. 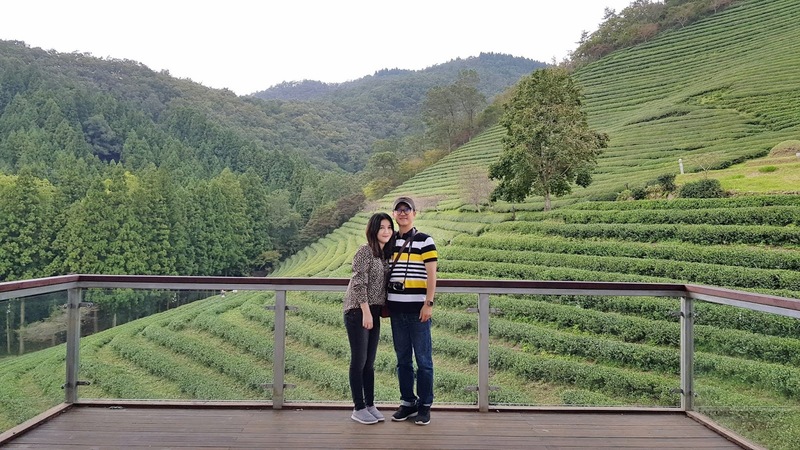 It's amazing that you both love to travel so much! I love that!! This is a real beauty. 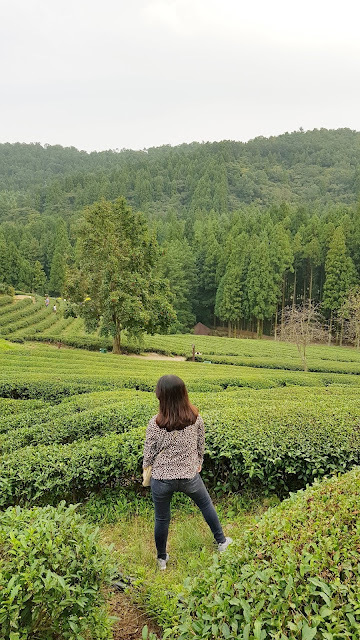 Staying and visiting tea garden are in my bucket list. Those views are breathtaking. It looks like such a nice place to getaway from the hustle and noise of Seoul! What a lovely green tea plantation! The nature there is amazing. Everything is so green. I love to drink green tea, so I would love to visit this plantation. 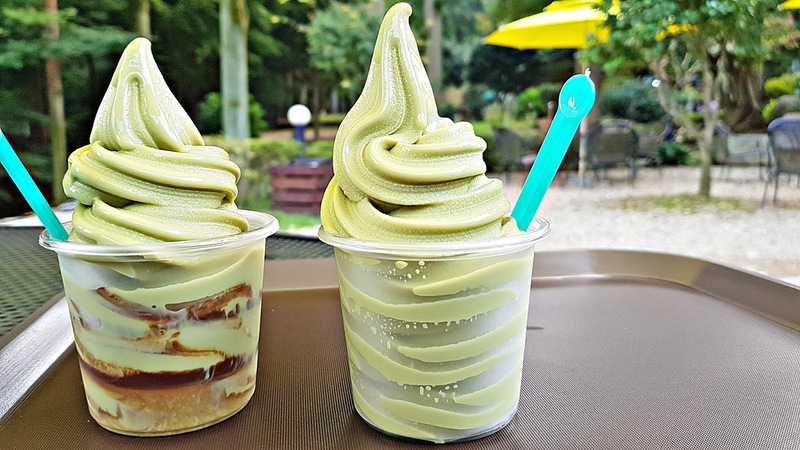 I also want to try that green ice-cream. Thank you for your lovely comment. Happy 2019!!! Amazing blog post! Keep up the good work! Really nice photos, you look pretty:) Thanks for sharing! great post dear ... im a new folower your blog . i hope you will be back. Nice Post! and thank you for your comment in my blog. I am follow you right now I wait you in my blog. Hi Roseline! It seems you had a really nice trip there! Happy new year 2019! Btw, I just followed you! Hope you'd be kind enough to return the favor, babe! 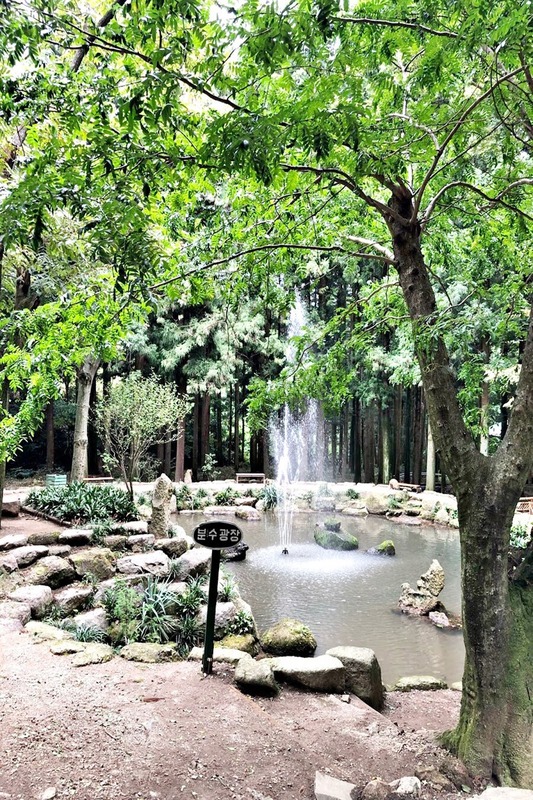 What a nice place! love how green it is! 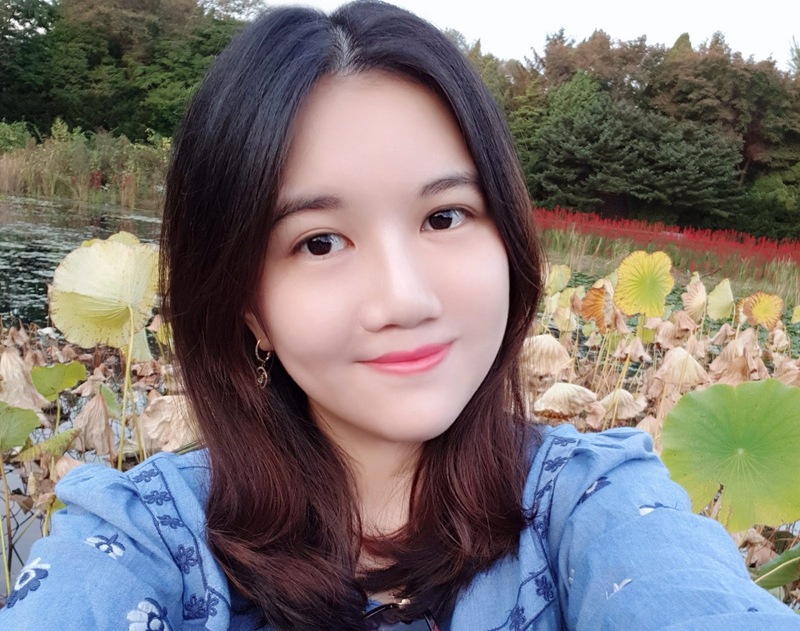 hope you can follow me soon! It must be such an experience to visit such a tea plantation! Pure beauty, I'd love to be there and discover this place ! So beautiful and green! I love places like these!